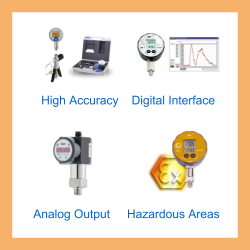 Low cost digital pressure gauge with an accuracy of 0.5% pressure range for general purpose industrial measurements. Measure the pressure of fluids or gases in a range of pressures from the lowest range of 0 to 1.6 barg up to the highest range of 0 to 250 barg. The DM 10 battery powered digital pressure gauge is compact and lightweight making it ideal for applications on mobile pressure monitoring equipment. Once installed the displayed reading can be rotated by a total of 330 degrees in vertical plane and 300 degrees in horizontal plane. The parts in contact with the process media are stainless steel, ceramic and FKM and the pressure gauge can be used with gas or fluids compatible with these materials. 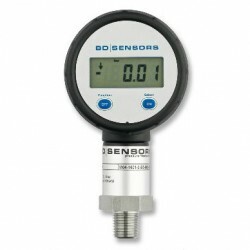 For convenient mounting the DM10 pressure gauge includes a positionable display to ensure the reading is horizontal and pointing in the most easily viewed direction for the user. The digital display of the DM-10 pressure gauge includes user interface buttons for accessing pressure units, calibration, hi/lo reading store and auto-power save menu screens. The DM10 has a choice of a fixed 1/4 inch BSP parallel or 1/4 inch NPT male tapered thread and a choice of 4 popular pressure units selectable by the user. Use on trash and recycling compactors for daily rounds to provide the highest pressure achieved by a compactor. For compactors located on a remote site without external power, the DM10 can be installed on any accessible connection, and is powered by the internal operates on the internal battery, which can last for up to 60 days continuous use. The pressure reading is continually monitored and the stored highest value updated whenever it is exceeded. Measure the pressure of clean methanol. Record the highest pressure a water jacket circulation loop gets to in a food production loop. Checking liquid packaging plastic bags under air pressure up to 20 psi to to see the max pressure after the bag has exploded. Use to measure groundwater pressure attached to a tap on top of a water bore hole. Checking Nitrogen charge pressure in racing car suspension dampers. Using the maximum pressure reading store function to testing pressure relief valves on pumps. We are looking for a digital water pressure gauge for unattended measuring of domestic water pressure delivered to a building. The purpose of use will be to recognize whether there have been any surges in utility pressure. How long can this location be monitored, can the DM10 be left on for a week to record the lowest and highest pressure? The DM10 has a battery life of 1500 hours (~9 weeks) so as long as the auto turn off is deactivated you will have plenty of battery life to monitor the maximum & minimum water pressure delivered to the building continuously over a 1 week period. Please select the options you require for the DM10 Low Cost Battery Powered Pressure Gauge in your application and request a quote. Send us your enquiry for DM10 Low Cost Battery Powered Pressure Gauge to get assistance with this product type.